Coined by Lean manufacturing experts, the visual workplace is a workplace that places critical information at the point of use, but wait there’s more. A visual workplace is a concept that relies on visual cues around the workplace to reveal critical information to anyone who can see them. Organizations have used wall signs, floor signs, floor tape, labels, placards, displays, and many other creative visual cues to keep employees focused and productive at work, while being reminded of critical information with as little interruption as possible. Visuals help to create an environment that not only promotes safety, but also a culture that is continuously re-enforcing the organization’s values. It provides a universal language that anyone can interpret and feel a part of. When it comes to the visual workplace, Dr. Gwendolyn Galsworth is one of the leading experts on the planet. She has a very tactical approach to the visual workplace which has been embraced by many organizations around the globe. Results from her training have led to increased performance and improved cultures in all aspects of the organizations that have welcomed the her visual workplace approach. Her book “Visual Workplace — Visual Thinking,” has been instrumental in helping visual workplace implementers everywhere and is a must read for anyone looking to improve their workplace. A flooded wall full of signs and instructions that overwhelm and distract the senses simply confuses the recipient. This is not a visual workplace and in a Lean organization, would be considered nothing more than waste, which is exactly what a properly designed visual workplace is designed to combat. There are thousands of possible devices that you can use to design your visual workplace, but only when implemented strategically, do they bring value to your organization. If you don’t understand why you are putting up the visual cue, then you can’t expect it to improve quality or safety in your workplace and it should be re-evaluated. Everything should be purposely displayed and should fit seamlessly into the facility. If it seems out of place or overwhelming, then it’s only going to slow down and/or distract employees. A visual workplace is designed to improve every aspect of your workplace, not confuse or slow it down! Eliminate information deficits and waste: Every time an employee has to look for information that pertains to the job they’re performing, time is wasted and their ability to do their job efficiently and effectively is in jeopardy. If you build in critical information directly into the physical environment, you can then relay the information at the point of use, instead of having employees go look for it. 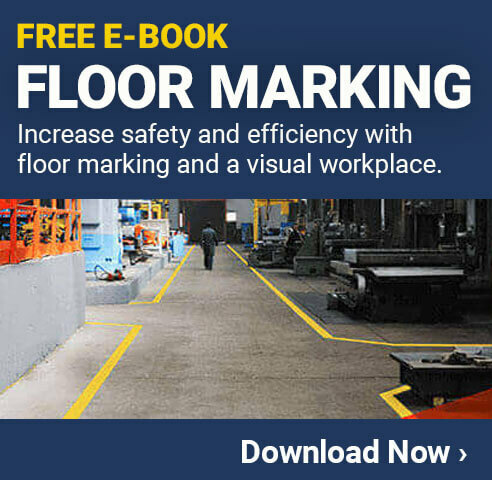 This will help improve productivity, quality, and safety. Improve Training: Research has shown that individuals gain 75% of what they know visually and only 13% through hearing. You can use the visual workplace as an ongoing training device that is constantly providing important information or changes in the workplace. Informed employees make fewer mistakes and add value quicker when you don’t have to keep re-communicating messages. Increase Productivity: A correctly designed visual workplace will have a positive impact on productivity, cost, quality, on-time delivery, inventory, and equipment reliability. Best of all, a visual workplace will help sustain these benefits for years to come. The visual workplace is not just a Lean tool to improve efficiency, it is also a means of improving the safety and well-being of your employees as well. Your path to continuous improvement is an important journey that will undoubtedly have interruptions, and while your Lean processes help you work through the hiccups, the safety of your employees should always be number one.